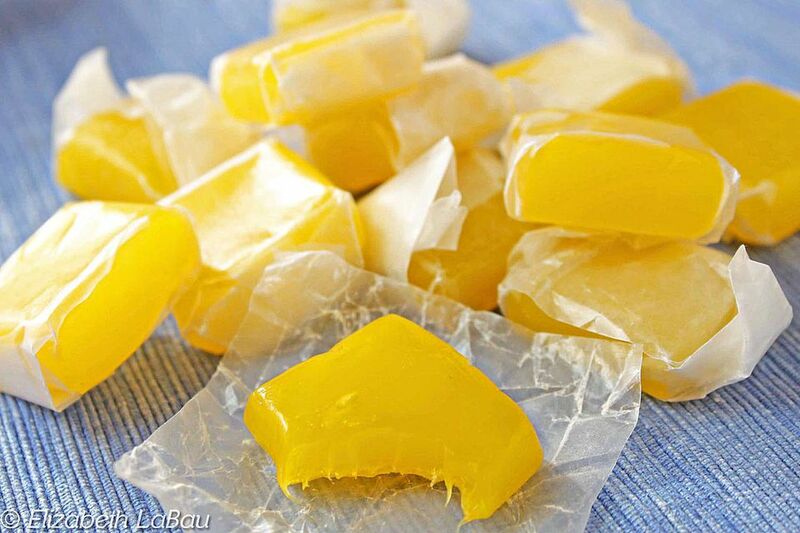 Lemon Chews are wonderfully sweet-tart candies with a smooth, chewy texture and flavor similar to Starburst candies. You can use other extracts and food colors to make different flavors of fruit chews. This recipe calls for citric acid, which accentuates the tartness of the lemon extract. Citric acid can be found in many specialty baking stores and large grocery stores—We found ours in the bulk spices section of a nearby grocery store. It can be omitted, but the candies will be missing an extra sour punch. Prepare a 9x5 loaf pan by lining it with foil and spraying the foil with nonstick cooking spray. Combine the butter, corn syrup, and granulated sugar in a medium saucepan over medium-high heat. Stir until the butter and sugar dissolve, then wash down the sides of the pan with a wet pastry brush to prevent sugar crystals from forming. Insert a candy thermometer. As soon as it reaches the proper temperature, remove the pan from the heat and stir in the lemon extract, citric acid, and yellow food coloring. Stir until the ingredients are well dispersed, then pour the candy into the prepared pan. Allow the candy to set at room temperature until it cools and sets completely at least 4 hours or overnight. Once set, remove the candy from the pan using the foil as handles and flip it upside down on a cutting board. Carefully peel the foil off the back. Use an oiled chef's knife to cut the candy into small 1-inch squares to serve. Because Lemon Chews are soft and chewy, they will gradually lose their shape if left alone at room temperature. We recommend wrapping them in waxed paper to make them easy to save and handle. Individually wrapped Lemon Chews can be stored in an airtight container at room temperature for up to two weeks.